Darren Lynn Bousman's new thriller heads back to the 1950s to explore old horrors. My father attended Catholic schools in the late 1920s and early 1930s and told me how his teachers enforced discipline with rulers and belts. 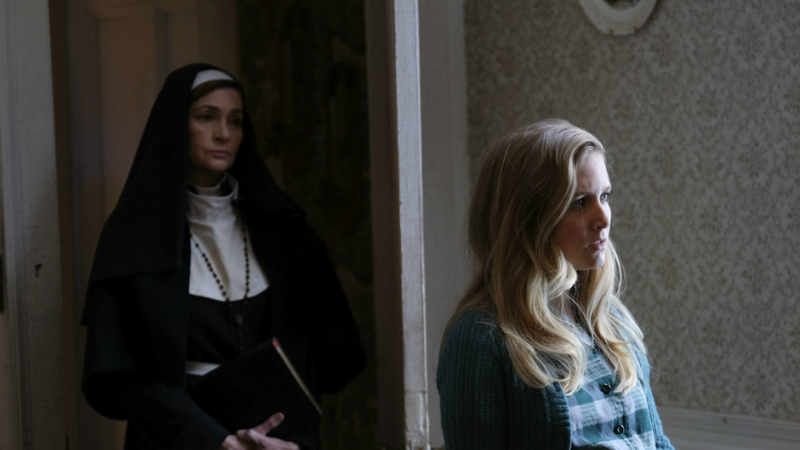 Set in the late 1950s, Darren Lynn Bousman's new film tells about nuns inflicting far worse discipline upon young pregnant women. Single and pregnant, Mary (Sabrina Kern) seeks refuge in an isolated religious convent. It's 1957 and her musician boyfriend has headed off on tour. He loves Mary and wants to raise their child with her, but he doesn't hesitate to leave her behind so he can earn money to support them. Without the support of her family or anyone else, Mary reluctantly decides to accept an offer made to her by a nun at a soup kitchen. Mary is desperate but she's also more than a bit wary of the apparently generous invitation to come live in the convent. And Mary is right! Very quickly, the nun, actually the Mother Superior (Carolyn Hennesy), demonstrates that the rod of disciple is very literal to her, and the rod is made of iron and steel. Mary only remains because she has nowhere else to go. Quickly, the stifling, repressive atmosphere in the convent becomes overwhelming. It has already snuffed the joy out of the other young, unwed women who have come there, and Mary finds it hard to resist when she is faced with so much opposition from Mother Superior and her fellow abusive nuns. Their words are hurtful and demeaning, which pairs perfectly with their actions, which are hateful and damaging to the bodies and souls of their young charges. It's a form of torture, though it's restrained just a bit because of another secret that the convent is hiding, which requires that the young mothers be able to give birth to healthy babies. That doesn't seriously rein in the extensive terror of their toxic speech and conduct. Unlike Bousman's three Saw films more than 10 years ago, which became increasingly repulsive in their physical atrocities, St. Agatha traffics more in psychological afflictions and psychic damage, with an emphasis on the emotional toll that is taken upon the young women. My taste in horror films has always steered away from the explicit violence that some prefer, and so the lesser amount of explicit violence shown in St. Agatha stays within my comfort zone. It's still not an easy film to watch, though, primarily because of the horrible suffering that is endured by the younger women, who all feel trapped because of their circumstances. Even though this is a fictional account -- Andy Demetrio, Shaun Fletcher, Sara Sometti Michaels and Clint Sears are the credited writers -- it feels very much like something that could have happened, which is a credit to the writers and the production crew, as well as Bousman and the actors. Sabrina Kern makes for an exceptionally sympathetic lead character, drawing upon inner resources to keep her resolve strong, despite the conditions she faces. Carolyn Hennesy makes for an imposing, authoritative figure who demands strict obedience; she's the type of villain who believes in herself, which makes her all the more hateful. Avoiding most of the expected pitfalls and narrative turns of a slow-building, psychological thriller set at a religious convent, St. Agatha is an unflinching depiction of a certain time and place, when nuns exploited other women. It's not exploitative; it's sickening to the soul. The film will be released by Uncork'd Entertainment in theaters and On Demand / Digital HD on Friday, February 8, 2019.